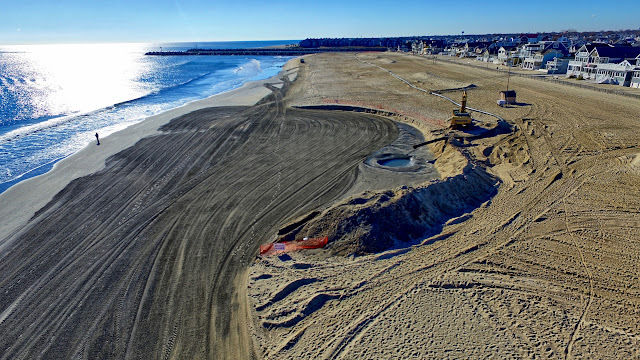 Now that the NJDOT has funding, the project to dredge parts of the Manasquan Inlet and use the beach quality sand spoils to replenish the beach in Manasquan that I previously covered has commenced. The project received a bit of a firestorm of criticism as it got started this week; somewhat understandably as videos such as Becky Burt's below showed the outfall pipe spewing a black substance onto the beach. 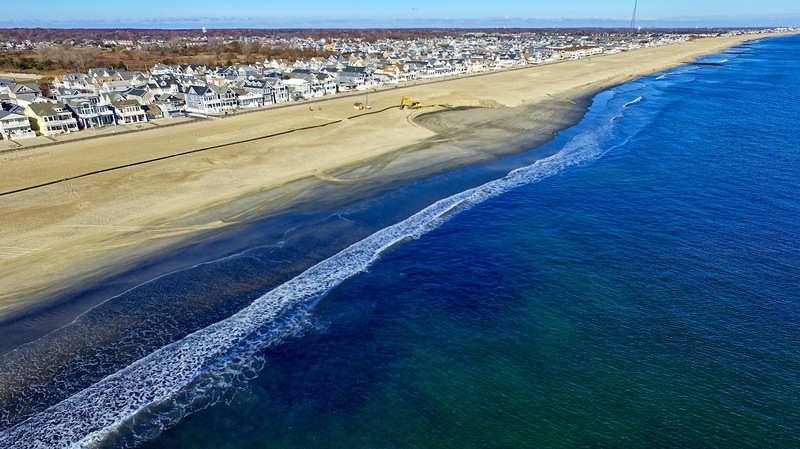 Also, many residents were concerned about the amount of garbage that was being pumped along with the sand; so much so that the Manasquan BoardRiders Club organized a beach sweep for volunteers this morning, and Manasquan de-winterized the Beach Tractor and Rake to comb the area. 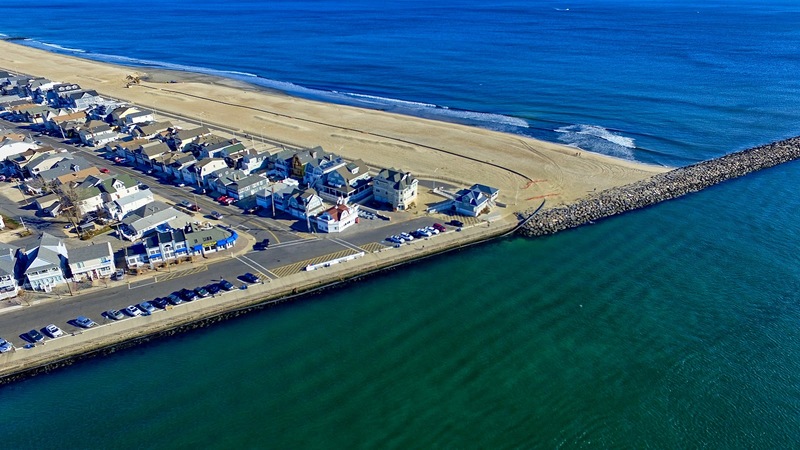 I went up to the beach this morning with the drone to take a look; it had been too windy the last few days as the project got started to fly. 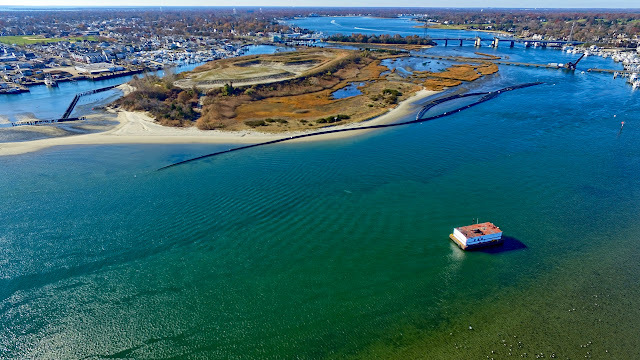 First, heres a shot up the river with the Gull Island CDF to the left. You can see the black pipes that are for dredging the north side of Gull Island and near the Railroad Bridge. The CDF is intended for spoils that are not suitable for the beach. 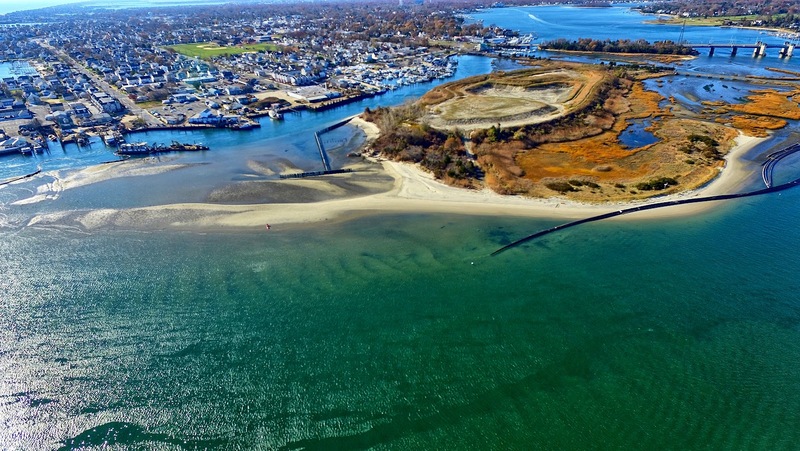 Here's another shot a little closer to Gull Island, where you can see the active dredging occurring on the southeastern side of the island. 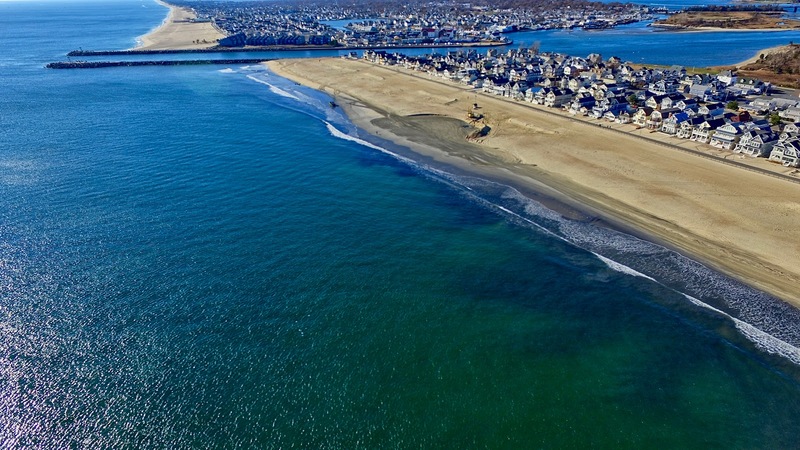 A little closer in, you can see the dredging barge set up to dredge sand from across from the Wharfside and up through Willy's Hole. 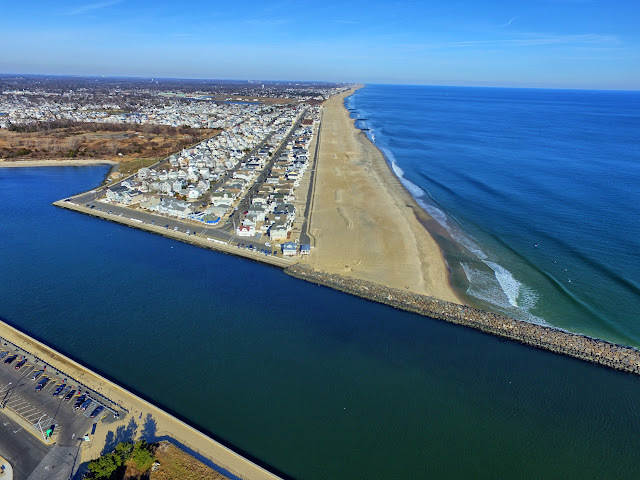 The pipes from the river then run up along the Manasquan side of the inlet. The pipe then makes a northernly turn out from the inlet and over the inlet jetty and onto Surfer's Beach in Manasquan. The pipe has been buried in many places to allow surfers and fishermen to traverse the pipe to get to the shoreline. The pipe currently terminates just north of Whiting and turns towards the ocean. Evidently, while the primary current runs south to north along the Jersey coast, the presence of the Mansquan Inlet causes the current closest to the beach to swirl back towards the south up until just about this point. The thought is, that by placing the sand here, it will be naturally mostly distributed down towards the inlet jetty, and help stave off the northward erosion of the current further offshore. 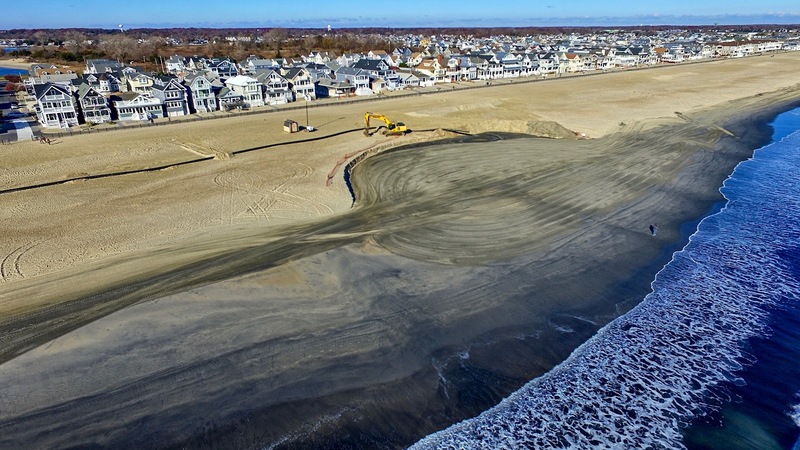 You can already start to see the expansion of the beach immediately east of the discharge point. And, that yes, currently, the sand is very black, especially compared to the existing sand (most of which came from the previous offshore Army Corps of Engineers replenishment post Hurricane Sandy). 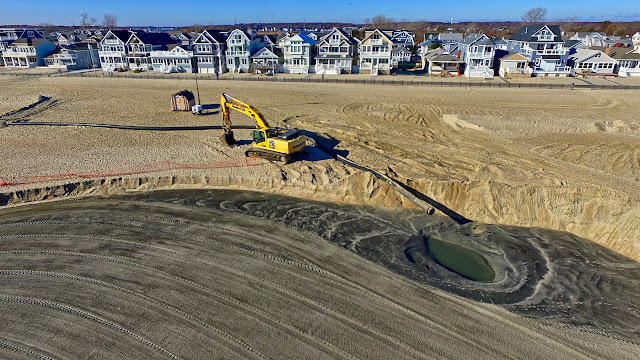 The sand is darkest closest to the discharge pipe, and you can see that the efforts of the Manasquan Beach Tractor have already helped to spread out the dark sand as you move further away from the pipe. Currently, it isn't very pretty. It smells like the river (which makes sense...it is from the river), and it is very black. However, garbage that is getting dredged up aside, I think everyone needs to relax. It is November, almost December, which gives us almost 6 months until the start of the summer beach season. The black color is decomposed organic matter mixed in with sand that hasn't seen the light of day in a long, long time. The more sun, wind, rain, and tide that beat on this sand, the more the organic material will break down and wash away. 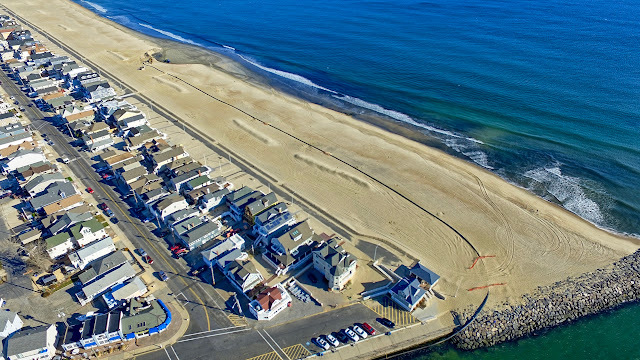 The sand itself looks good; it looks like our native Manasquan sand, just dirty. Yes, there will be some striation as sand from up the beach and out in the ocean has the potential to cover up parts of this new sand and prevent it from completely bleaching out, which means you might come across it when you dig your sand fort next summer, but I'm fairly confident we'll be looking at fairly clean sand in a few months. I do implore the town, the DOT, and the DEP to ensure that more scrutiny is applied to the filtering of material that is being pumped up here; this is our beach, our greatest natural resource, not a CDF. 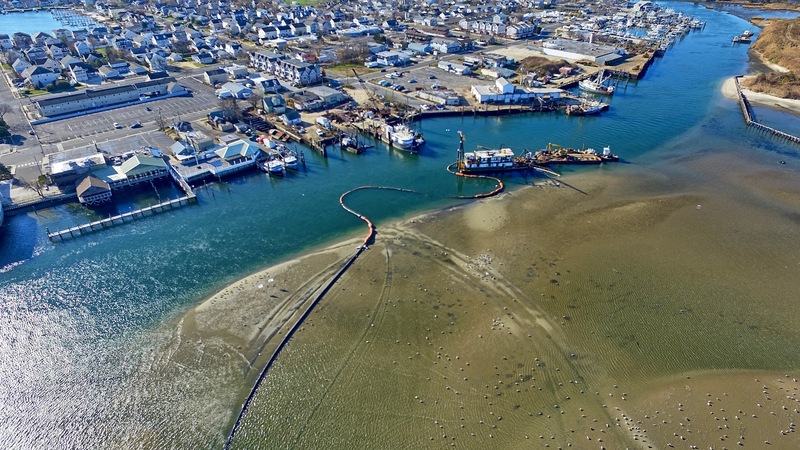 They were not running the dredging today, maybe because of the outcry, or maybe because it was Sunday, so i'll try to get back and get some footage of the pipe pumping out sand and water this week. 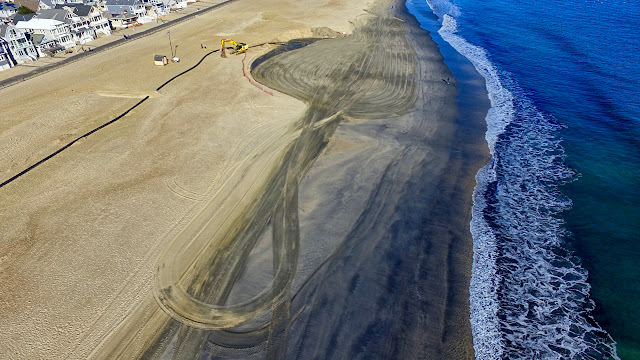 Until then, here's a quick video of the site, with the Beach Tractor helping to spread out and clean the new sand. Nice overview - both DEP and Mon Co Hazmat have been to the site Sat and Sunday and one of the beach sweep volunteers collected a sample of the spoils for testing at a private lab. - just to get another confirming opinion of the contents of the sediment. Thanks Bob for the info - please reach out if you hear of any troubling results from the private lab. 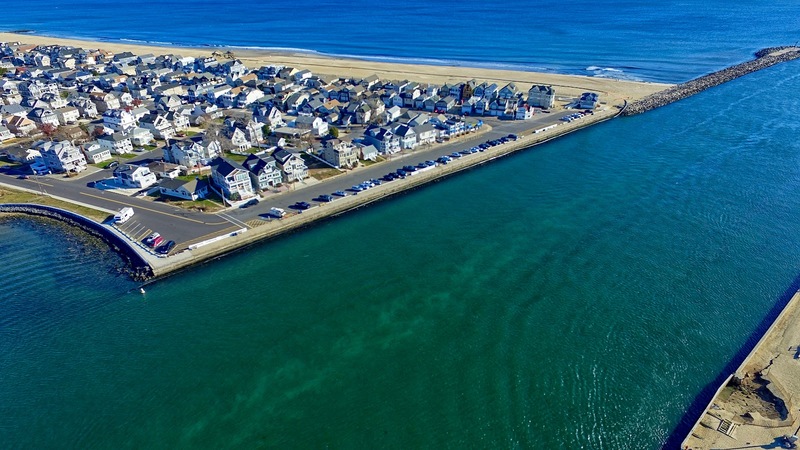 Advantages of the drone technology have been inestimable for the clients since it is loaded with every most recent choice for the general population. The nations have been utilizing mini drones for the presentation on all fronts for the wars and fights.